Xbox voice commands are no new thing, but today Microsoft announced that voice commands for your Xbox can now be used through devices with Alexa and Cortana features. 'Xbox Skill' is the brand new feature that governs this update, which is available today for select Xbox Insiders. Announced over on Xbox Wire, "you can use voice commands to power your Xbox One console, adjust volume, launch games and apps, start and stop broadcasts on Mixer, capture screenshots, and more." While this new feature is only available to Xbox Insiders right now, there's no word yet on when Microsoft will be rolling it out worldwide for all. On your Windows 10 PC, click here and sign in with your Microsoft account to link the skill. Try your first command! 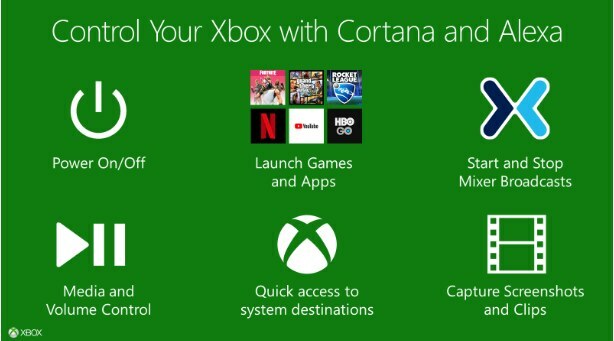 "Hey Cortana, tell Xbox to open Netflix." Try your first command! "Alexa, start Rocket League." As we mentioned before, there's no confirmed schedule for releasing Xbox Skill for everyone, but we'll make sure to report back on any further developments for the new feature.